"Friendship, joy and peace will be the highlights of this event," Pope Benedict XVI said upon the start of his visit in Cologne. Awaiting the 78-aged pope were an estimated 400,000 young pilgrims gathered in western German city. Photo by Deutsche Welle. Pope Benedict XVI was greeted by loud cheers as he stepped out onto German soil for the first time on Thursday. He was welcomed by representatives of the German government, including President Kohler and Chancellor Schroeder and his wife. It was noted that Pope Benedict obviously intends to lend his own style to trips abroad... he did not kiss the ground like his predecessor. Before leaving for Germany, the pope said he was looking forward to the visit as it was not only to his homeland but was also an opportunity to meet with young people. 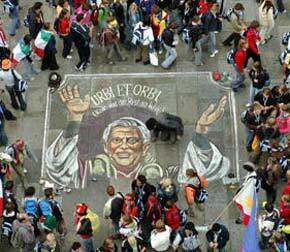 He said that being part of world youth day would be a great event, as hundreds of thousands of young Catholics have gathered in Cologne.